For the next three weeks until Christmas, I will be hosting a linkup showing off your Merry Manicures! I know it's short notice, but feel free to come back throughout this week to link up or wait til next Monday. Show off your holiday-inspired nails, and get the opportunity to meet new friends and find new blogs to follow. 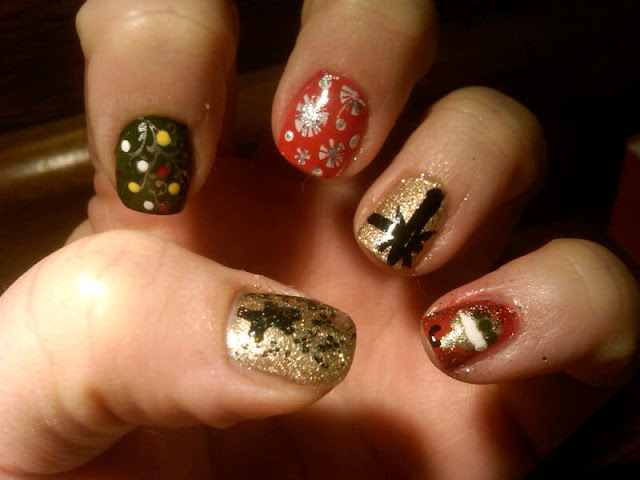 Today I want to showcase my ugly sweater nails from last year's family ugly sweater party. I have nubs something fierce right now or I would make a new manicure. I used my Bundle Monster plates for the tree-inspiration as well as the peppermints and gingerbread man, and a combination of polishes, I can't remember them all I apologize! Go ahead and link up, and spread the word! I am also sharing my manicure over on Mani Monday and The Nail Files. Love love love this link up!! I didn't get a chance to paint mine last night... might try tonight because i'm LOVING those candy cane nails. I LOVE this manicure!!! So pretty! I love these! They are AMAZING!! You are so talented and creative! You need to be a director at Zoya or OPI!! you nails looks great. I will have to come up with something cool for next week. So cute! I love the theme!